Approximately 820 people were treated at hospitals nationwide with symptoms of heatstroke amid rising temperatures on Sunday. According to Japan's Meteorological Agency, temperatures rose to over 35 degrees Celsius in various areas across Japan on Sunday, recording 37.5 C in Tatebayashi, Gumma, 37.3 C in Otsuki, Yamanashi and 36.8 C in Kumagaya, Saitama. Temperatures in Tokyo also soared to 35.4 degrees, the highest this year, the agency said. 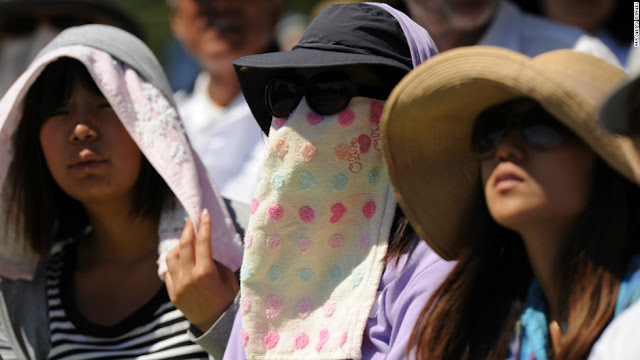 Temperatures in Tokyo soared to 35.4 C, the highest this year, the agency said. Among the patients treated with heatstroke symptoms were four farmers in Osaka, whose conditions are still critical, Sankei Shimbun reports. A woman in her 80s, who was working at a rice field in Kawachinagano, Osaka Prefecture, died on Sunday after falling unconscious due to the heat. The Meteorological Agency says it is expected that temperatures will continue increasing, urging people, especially the elderly, to drink plenty of water and use the air conditioner.